Is BlackBerry back? We’ll get our first real indication on Friday when the company reports earnings for its latest quarter, the first since the launch of its Qwerty-keyboarded Q10 device, and the second since it began shipping its developing portfolio of BlackBerry 10 smartphones. Today, opinions on just what sort of financials BlackBerry will post on Friday are divergent, to say the least. Recent reports from Bernstein Research and Pacific Crest suggest that demand for the company’s new BlackBerry smartphones has fallen off so much that the devices are just piling up in inventory. 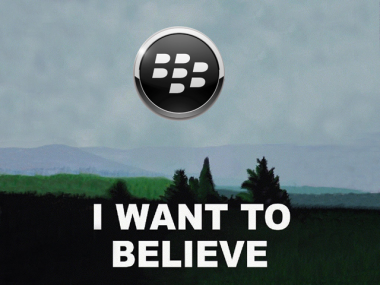 But others are more upbeat about BlackBerry’s prospects. To wit, a new research note from William Blair & Company analyst Anil Doradla that claims BlackBerry is benefiting from a refresh cycle, one that’s going to drive demand well into the fall. An encouraging prediction for bulls hoping for a BlackBerry resurgence, but one whose accuracy promises to be difficult to gauge without concrete BB10 sell-through numbers. And, so far, BlackBerry has been unwilling to provide those, preferring instead to dole out carefully crafted statements claiming that BB10 handset sales are far better than some number the company isn’t quantifying. And that’s problematic for investors, and really for anyone who is watching the company, as Pacific Crest analyst James Faucette recently argued. Hopefully, that will change come Friday. But don’t get your hopes up. After all, vague pronouncements like those Faucette mentions above allow BlackBerry to tell investors exactly what they want to hear, regardless of actual sales figures.